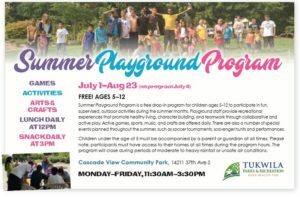 Preschool, Youth, and Teen Program staff create opportunities to help kids form positive self-esteem through play, recreation, and healthy lifestyle initiatives. All of our staff are CPR/First Aid certified, attend annual trainings, and the children they serve. A variety of enrichment, sports, wellness, and educational programs and classes are offered. 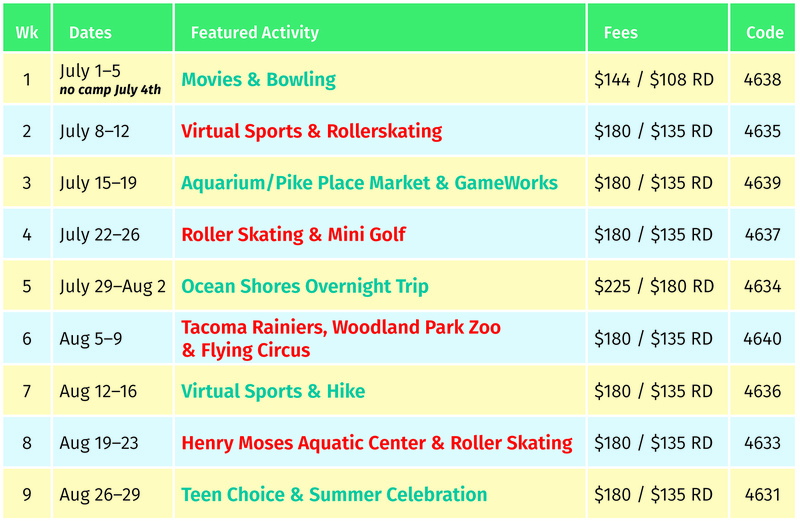 For more information, view the seasonal activities guide or view programs online. Please note, not all programs are available for online registration at this time however will be soon. Our friendly staff is available to answer questions at 206-768-2822. The following handbooks and registration forms provide an overview of a few specific programs. **Save yourself some time! Print out, complete and bring the camper information form with you when you register. Camp Tukwilly is a super-lively, full day, safe, active program focused on quality, age-appropriate activities, and most important, FUN! Campers will experience new discoveries, go on weekly field trips to local parks and are attractions, and make new friends along the way. Camp is open to those entering grades K-5 at the beginning of the 2019-2020 school year. Camp runs July 1st-August 30th, Monday-Friday from 6:30am to 6:00pm. **Camp will be closed on July 4th. A $25 weekly deposit (nonrefundable and nontransferable) per week is due at the time of registration to secure your child’s spot in camp. The deposit will be applied to your weekly camp fee. 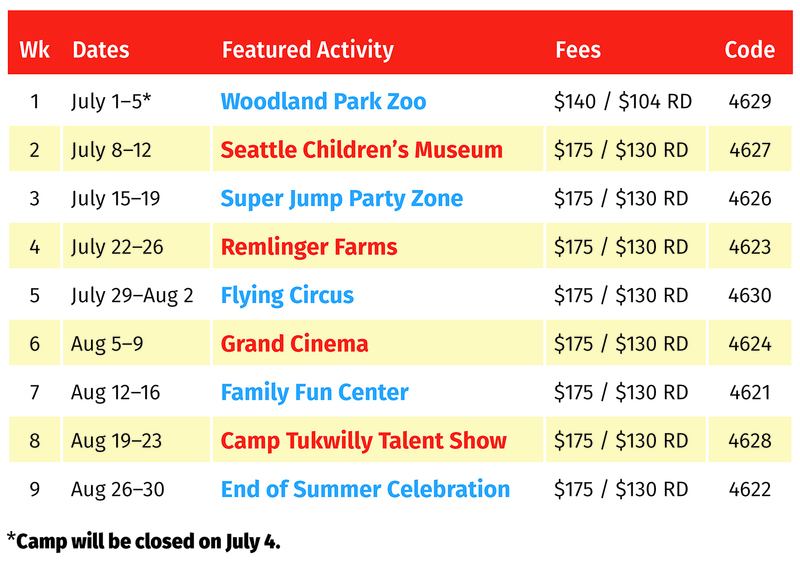 Camp fees are due on Monday, one week prior to the week your child is registered to attend camp. Share adventures with new and old friends while experiencing fun places all around the greater Seattle area! Although many of the camp activities have already been planned, the schedule is subject to change. Camp runs July 1st – August 30th, Monday-Friday from 6:30am to 6:00pm. **Camp will be closed on July 4th. The L.I.T. (Leader in Training) program provides a work-oriented experience that gives participants the opportunity to begin to learn and understand the demands and responsibility of the leader’s job. Summer LIT’s will be placed in Camp Tukwilly. LIT’s are selected through an application process. Application deadline is May 17th. We will hold interviews the week of May 20th. Fee for the program is $120 and will be due once accepted to the program. Click here for more information, application, and application process . 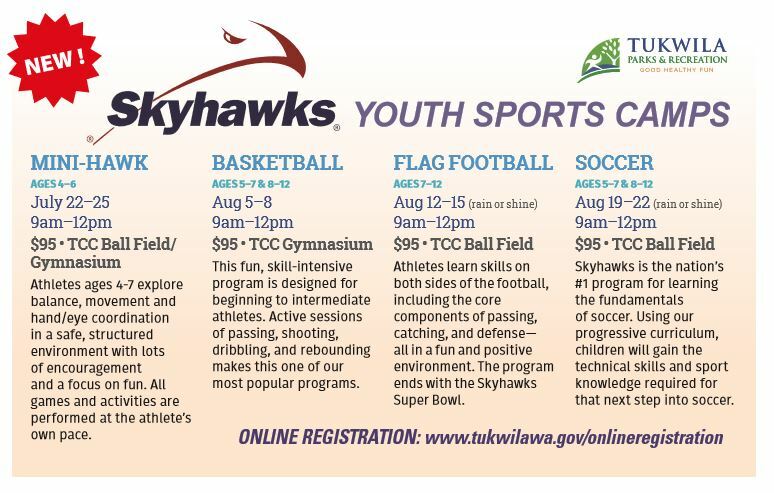 Youth Summer Athletic Offerings – Click Here to Register!